When Ayatollah Khomeini issued his death fatwa against Salman Rushdie in February 1989 for writing the Satanic Verses, 44 out of the 45 member states of the Islamic Congress (1989) condemned the ruling of the Ayatollah as un-Islamic. Many critics have pointed out that this was a fact ‘the West’ chose to ignore in its rush to present the Ayatollah’s ruling as representative of Islam’s ‘true nature’ as a religion of intolerance. Condemn[s] the audacity of those who are not qualified in issuing religious rulings (fatwa), thereby flouting the tenets and pillars of the religion and the well-established schools of jurisprudence. The fact that there are now people within the Maldivian society who feel comfortable enough in their own rightness, righteousness and ‘learnedness’ to flout the teachings of Islam in its name by calling for the beheading of a fellow man for his views clearly demonstrates the extent of human intolerance Maldivian society has come to tolerate in the name of religion. Anyone who does not agree with this particular brand of Islam is now being denied, among other fundamental rights, their right to exist. The only Muslims who will be tolerated in this society are those that follow Wahhabism. Ironically, this is a kind of practice that the first Commander-in-Chief of the ‘War on Terror’, George Bush, found rather suited to his own policies – he denied members of al-Qaeda the right to be Muslims by doggedly and repeatedly describing them as ersatz Muslims who had ‘hijacked the religion of Islam’; and by pursuing policies that, in turn, validated all such claims. In defining Islam according to his version of it (‘Muslims are doctors, lawyers, law professors, members of the military, entrepreneurs, shopkeepers, Moms and Dads’) Bush denied the self-proclaimed ‘holy warriors’ the very religion in the name of which they were sacrificing themselves. In so doing, he effectively removed any justifications of their cause, at once turning them into ‘Evildoers’ with no motive and no cause other than Evil, pure and simple. It is this very practice that followers of Wahhabism in the Maldives are engaging in – by making their beliefs the only ‘true Islam’, they are denying a large section of the Maldivian society their right to be Muslims; and in so doing, are removing the right of many a Maldivian to be treated as equal citizens with the same rights as those who do not practise the same brand of Islam as theirs. By re-defining what it means to be a Maldivian Muslim they are rendering those who do not conform to their teachings irrelevant to society. Non-followers of Wahhabism are being re-cast as non-citizens, and non-Muslims. Furthermore, they are being made non-human by calling on laws of the jungle, rather than the law of the land, to be applied to them. They become beasts whose heads have to be cut off, a beastly scourge the rest of society should be cleansed of. No longer Dhivehin, no longer Muslims. And no longer human. The discourse of the ‘War on Terror’ worked in precisely the same manner in successfully rendering ‘detainees’ or ‘enemy combatants’ (not to be recognised as prisoners of war, lest there be any rights) in Guantanamo Bay and Abu Ghraib into non-human ‘Evil’ entities with no place in civilisation. As Godless, faithless, non-human creatures outside of legality itself, they could be kept in indefinite detention without trial, abused, tortured and then abandoned. This is what the followers of Wahhabism are doing to the Maldivian society. Rendering a part of it Godless, faithless and non-human. Their removal from society if they do not conform to Wahhabism thus becomes not just justifiable, but necessary. Soon, there will be no Maldivian left who does not follow the brand of Islam that they advocate, not because everyone has willingly followed where they previously refused to tread, but because Wahhabism would have become the only definition of what it means to be a Maldivian Muslim. If – and it is a big ‘if’, given the obfuscation and vacillation of official policy – this is not the future that the Maldivian government has envisioned for the country whose democracy the current President fought so valiantly for, then it should act soon to provide room for the freedom to grow of the Maldivian Muslims who do not follow this brand of Islam. Let people know – or at least open up the channels through which people can find out – that Wahhabism cannot lay claim to ‘true Islam’ any more than Bush can deny bin Laden and his followers the right to call themselves Muslims; and that there is nothing even remotely like a consensus in the Islamic world regarding the supremacy of the Wahhabi teachings over and above others in the religion of Islam. If pluralism is the government policy, then make it possible for people to see, and provide the opportunity for them to understand, the pluralism that exists within Islam itself. Expose people to the other side of the debate, let other voices resonate with equal vigour in the various venues and lecture halls the Wahhabis are so effectively frequenting. The followers of Wahhabism have a captive audience in the Maldives because they are the only act in town, because their script is emotive, and because they have chosen ignorance as the stage to act out their drama. Let the audience develop some discernment, and it will become possible to, at the very least, ensure Maldivians make an informed choice if and when they decide to take this country into a future of being an Islamic State with Sharia as its only law. Let the Wahhabis know that the government will not let itself or Islam, the religion that it has written into the Constitution, be used as instruments of power in establishing the supremacy of one particular brand of Islam in the Maldives. Equally important is to stop allowing Wahhabism to (re)define into non-existence a substantial part of the Maldivian population that makes this nation Maldives. Munirah Moosa is a journalism and international relations graduate. She is currently engaged in research into the ‘radicalisation’ of Muslim communities and its impact on international security. Edited: Please note that denouncing individuals as terrorists is considered defamatory under Maldivian law and such claims cannot be published, as per our Commenting Guidelines. I'm packing my bags to get the hell out of this heel hole. People all around me, all highly educated, are rapidly changing their dress codes to be "true muslims". Unfortunately, I'm still not a "true muslim" of this recent dictate and dont wont to be. I just HATE this government for letting loose Fareed and Ilyas. Everyone better run for your lives! As a matter of fact your father has always run away when pressure is applied. From the inception your dad always wanted to be given presidency on a golden platter. After the last time he fled it was the municipalty president Adam Manik who tried to convince ur dad to join with Nasheed as a running mate.Plus it was a fact that Gaumee Ithihaad was funded solely by this Adam Manik. Sometimes people behind the curtain should also be credited. Till then Your family was of the view that he could win the prsidency by contesting as an independent candidate. You people are so stubborn and modest. It is also a known fact that people including your father came into power to acquire more wealth. There were rumours your dad is involved in building a hotel and has been on the look out for investors. and mind you this was a resort and airport project. No wonder u were so hyped up when people protested against selling alcohol cos u r dad would have got land to build a city hotel as part of the airport project and then u guys are denied selling alcohol. And why dont you come back to the Maldives and work for the betterment of the county so that you would earn love and respect from the public. But as for u also u hold a dual citizenship meaning ur one leg is always in states. I do agree with some of ur views about religion and culture but dont harp too much about ur dad. 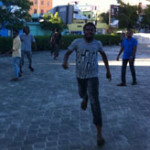 Salim Waheed, dont bother trying to prove anything to them. They are apt to pull out random accusations, create imaginary faults and accuse you of being intoxicated/muruthaddu/pingas for standing against what they think is how you should behave. Instead of focusing your attention to them, focus on writing MOAR awesome articles. Thanks Ahmed, I'm done with this line of conversation. I've had my say - and anyone who's dim enough to still believe in our cowardice won't see the light. As for the accusation of corruption. You will not find a person less corrupt. Dr. Waheed has never had ANY business interests in the Maldives. He is also the only person who has declared ALL of his assets. I fully admit my bias towards my father. But that is because I am his son, and of course have been privy to all the extraordinary steps he's take for the betterment of humanity. As for Sarangu Adam Manik, I have a great amount of respect and love for the man. When you look at the books, he was the sole largest contributor to GIP. However, (from my understanding) his total contribution is around 35% of the funds the party received during the election cycle. And I do not talk about myself or my father or my mother unless attacked. I simply can't take abuse lying down. Oh, and now that you've written "As for Sarangu Adam Manik, I have a great amount of respect and love for the man. When you look at the books, he was the sole largest contributor to GIP. ", watch out for MORE hilarious and random accusations regarding your sexuality. Good luck - here's hoping you cause more awesome out there! I guess its part of GIP menifesto that u declare ur assets. I did not say Dr Waheed is corrupt. but Maldives is small and specially the busineess community is aware when business deals go through or dont etc. They say there is no smoke without fire. We elected ur father and the His Excellency for a better future. So first lets keep personel interests aside and try to run the damn country.